NGC 1073 is a face-on, barred spiral said to be at a distance of 55 million light-years. Astronomers think it is similar to our Milky Way because streams of blue star clumps stream out from around the ends of a reddish bar. The arms bifurcate, splitting at several “Y junctions” to multiply the number of arms, as in the Milky Way. Only about 20% of ancient spiral galaxies have bars but two thirds of nearby spirals are barred. This suggests that bars form as spiral galaxies change their shapes. Image credit NASA & ESA. Scientific stories of how galaxies formed start with a tiny bit of vacuum that exploded 13.8 billion years ago. This space-time explosion created everything out of nothing, forming an expanding cloud of light-like particles. After a few hundred thousand years, the cloud became opaque to light as atoms formed and dark (invisible) matter gathered together. From the cloud, first generation stars condensed. which were mostly made of hydrogen. Scientists believe that ancient hydrogen was identical to modern hydrogen, that matter is not changing itself as it ages. First generation stars exploded and created new clouds of dust, containing heavier elements. Invisible matter and black holes helped the the second generation stars to gravitate into galaxies. How do scientists explain the existence of spiral arms? They believe that the stars are orbiting the nucleus against the sweep of the arms. For example, in NGC 1073 scientists think the stars are orbiting counterclockwise. Supposedly density waves sweep through the galaxy pushing stars into spiral lanes. The bluish clumps in the arms are supposed to be star nurseries where stars are born as they condense from dust clouds. The biblical creation account is remarkably different from scientific stories. According to the Bible, First Elohim created (completed action verb) the shamayim and the earth (erets). Shamayim is the Hebrew word for plural skies. In the first verse it evidently refers to primordial galaxies since the atmospheric sky was not formed until day two. The first verse has a word: the first and last letters of the Hebrew alphabet. Like alpha-omega, it implies everything. Elohim finished creating everything : the plural galaxies and earth first. The next verse starts with the Hebrew waw character, which can mean: and, then or but. But the Earth was (completed action verb) formless and empty. Moses describes the Earth as a dark abyss (tehom) with a surface (paniym). Then Elohim’ wind dithered in unbroken continuity over the face of the transitory thing (mayim) as He continued to command light to continue to be. Evidently that is when formless matter began to have extension in space. Indeed, the properties of matter are related to light that dithers around within, giving substances extension. According to the Hebrew text, the stars began to form half way through the creation week as Elohim continued to command lights in the plural heavens. He continued to form the Sun, Moon and stars and continued to make them into spreading things (Hebrew raqiya), The Hebrew verb to spread or pound out is raqa. The noun form of this word is raqiya, the things that spread. Isaiah 44:22 tells us that God actively spreads out the plural heavens and the Earth in unbroken continuity. In Isaiah 40:26 He continues to call the stars to come out and none are missing. We confirm biblical creation with visible, cosmic history. We observe that the earliest galaxies were often dwarfs, without starry arms. The blue clumps in the arms are not orbiting in the opposite direction of the sweep of the arms, as scientists claim. We observe at many ranges and examples how the stars came out, moved out, spread out, followed each other out in lanes as billions of galaxies grew into huge growth spirals. We observe that the earliest galaxies shone at tiny fractions of the frequencies emitted by modern atoms. The stars in the arms of spiral galaxies often shine with different colors than the core of the galaxy. Evidently the star streams accelerated concurrently with the accelerating atomic clocks. What could cause galaxies to grow from the insides outward? All matter in the universe is changing in an orderly, together (relational) manner as recorded in the Greek verbs of Romans 8:19 – 22. Biblical creation is unlike scientific, galactic stories. Scientists admit that their universe is 99% invisible. They speculate mathematically that four times as much invisible matter exists as the visible variety. They make up ad hoc stories about invisible holes, vacuums that stretch light and vacuums that pull energy out of the vacuum to accelerate the stretching of the vacuum of space. They imagine that the spreading vacuum is pushing galaxies away from each other. All these myths were contrived to protect the creed of all scientists. Scientists believe that atoms yesterday were identical to those from today. Even their empiricism and mathematical laws were contrived with the notion that atoms are perpetual motion engines. 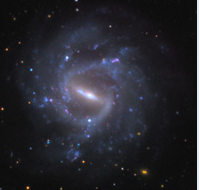 Two photos of NGC 1073 are from NASA. The light from this relatively close galaxy shines at 99.6 % of the frequencies of modern atoms. Why do the arms bifurcate at specific points? NGC 1073 has four quasars (IXO 5, J024333.6+012222, QSO B0240+011, and VV96PKS 0241+011) near the Y junctions in the arms. They shine at much lower frequencies that the stars in the arms. Is this an accidental alignment? Are they really far behind the arms they seem to be associated with or were they part of the bifurcation process? This is Hubble Ultra Deep Field galaxy 3031, which is also a face on spiral, but with only two arms. It is about one sixtieth the angular size of NGC 1073. Both arms in this primordial galaxy are emerging from one end of a bar. The arms are made of distinct separate clumps, like beads in a necklace. 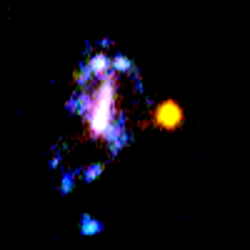 A yellow sibling galaxy shines at the end of one arm. The atoms in this primordial galaxy shine at 42% of the frequencies of modern hydrogen. Why does the arms spread out from only one end of its bar? Do bara form as the galaxies greo? We observe that matter continues to change relationally as galaxies grew into huge growth spirals. Elohim will make foolish the wise of this age, as He promised. They contrive myths about invisible things to protect their basic creed that the properties of matter are fixed, not emerging. Look at the sky and observe the glory of His creation, exactly as recorded in the Bible.